When I was young and believed in the Christian god, a few questions nagged at the back of my mind: every religion seems to have its own holy book, its own cosmology, its own sacred rote and routine, and its own unshakable belief it is the One. True. Religion. How can they all be right? And isn’t it a bit funny that the majority of people end up believing the religion they were raised closest too—the easy road? Thankfully these questions, along with the realization of a lot of other logical fallacies, achieved prominence to the point I gave up on Christianity, and organized religion in general. I can say I am a happier person for it. But what about the people for whom such mythologies are necessary—existence unthinkable without some religious framework to explain it? Chris Beckett’s 2016 Daughter of Eden, third in the Eden series, answers this question, and in the process forms the perfect bookend to the original novel, Dark Eden. More than 200 years have passed since the events of Dark Eden. Johnfolk, Davidfolk, and Jefffolk have started spreading themselves over the known parts of Eden and established a variety of villages, even a few bigger towns. At the outset of the novel a woman names Angela is rowing across World Pool to sell goods at a Davidfolk village. The trip is cut short, however, when she sees in the distance a small fleet of Johnfolk, armed to the teeth, coming across the water. Returning to her village to raise the alarm, Angela, her family, and fellow villagers flee into the woods in an attempt to escape. They run and run, until, encountering the most hoped for and yet seemingly unlikely thing that could ever happen on all of Eden. But that is only one half of Part One of Daughter of Eden. Among scenes of Angela returning to her village and fleeing into the woods there are flashbacks to the time Angela was a young woman, apprenticed to a Davidfolk shadowspeaker named Mary. Traveling among the villages to tell Gela’s story and generate interest in the Davidfolk’s religion, the flashbacks recount the arch of their relationship, from its innocent beginning to its dramatic end, describing the peculiar yet human mindset of faith-based belief in the process. The flashbacks laying the groundwork for Daughter of Eden’s theme, the end of the novel sees the relationship come full circle, having evolved through the events that transpire in Part Two. 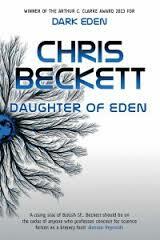 Like many people, I was enamored with Chris Beckett’s 2012 novel Dark Eden. Blending Christmas-tree colorful worldbuilding with a mythopoeic storyline effortlessly debating quandaries both religious and existential, it was worth the hype. The follow up, 2015’s Mother of Eden was a fairly good novel. It built upon Dark Eden, adding new settings and characters, but at the same time did not offer the same high-level discussion of its themes, foremost of which was women’s rights. A rather simplistic approach taken, there was not a lot relevant to contemporary Western society. By returning to the thematic outlay of Dark Eden and presenting the next iteration in socio-religious matters among Eden society, I think it’s fair to say Daughter of Eden, to a large degree, renders Mother of Eden spurious. Beckett synthesizing Mother of Eden’s events into the first 50 or so pages of Daughter, it’s entirely possible to read Dark Eden then Daughter of Eden and achieve a stronger whole.